Doctors are being murdered in bizarre manners - bats, bees, a killer frog mask, etc. - which represent the nine Biblical plagues of Egypt. The crimes are orchestrated by an organ-playing, demented madman (from his home base, replete with a clockwork orchestra and help from a beautiful, mute assistant). 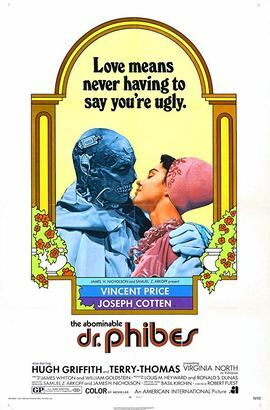 Detectives are stumped until they find that all the slain doctors once assisted a Dr. Vesalius on an unsuccessful operation involving the wife of organist Dr. Phibes, killed in a car crash upon learning of his wife's death. He couldn't be the culprit, could he?